Jean-Claude Bradley pitched the idea of Open Notebook Science, or Open-notebook science as the proper spelling seems to be. I have used notebooks a lot, but ever since I went digital, the use went down. During my PhD studies I still extensively used them. But in the process, I changed my approach. Influenced by open source practices. After all, open source has had a long history of version control, where commit messages explain the reason why some change was made. And people that ever looked at my commits, know that my commits tend to be small. And know that my messages describe the purpose of some commit. That is my open notebook. It is essential to record why a certain change was made and what exactly that change was. Trivial with version control. Mind you, version control is not limited to source code. Using the right approaches, data and writing can easily be tracked with version control too. Just check, for example, my GitHub profile. You will find journal articles been written, data collected, just as if they were equal research outputs (they are). 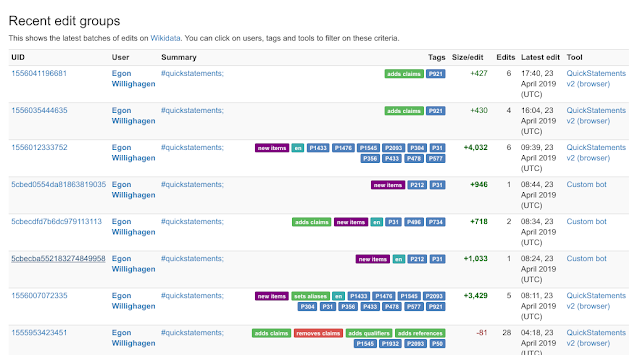 If only I could give a "commit message" which each QuickStatements job I run. Can I? Open Science has been around for some time. Before Copyright became a thing, knowledge dissemination was mostly limited by how easy you could get knowledge from one place to another. The introduction of Copyright changed this. No longer the question was how to get people to know the new knowledge to how to get people to pay for new knowledge. One misconception, for example, is that publishing is a free market. Yes, you can argue that you can publish anywhere you like (theoretically, at least, but reality says otherwise), but the monopoly is in getting access: for every new fact (and republishing the same fact is a faux pas), there is exactly one provider of that fact. Slowly this is changing, but only slowly. What this really needs, is open licenses, just like open source licenses. Licenses that allow fixing typos, allow resharing with your students, etc. But contrary to what has been prevalent in the Plan S discussion, these ideas are not new. And people have been trying Open Science for more than two decades already. 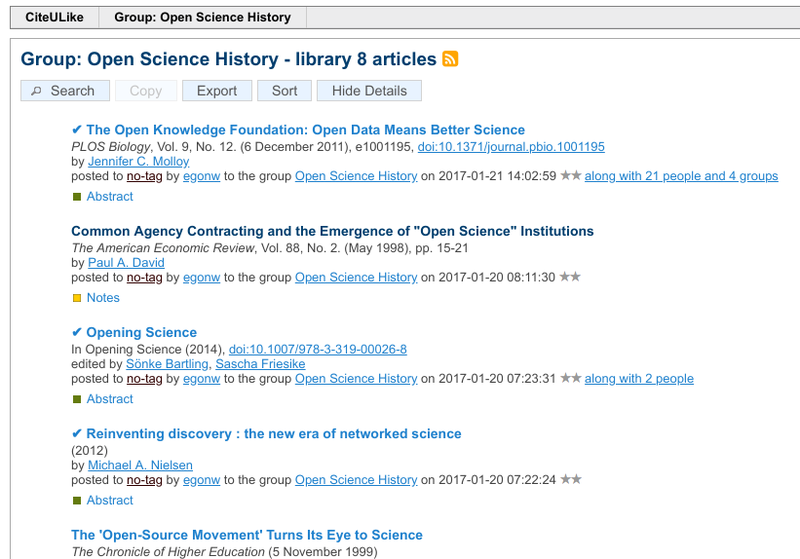 I have been trying to dig up the oldest references (ongoing effort) of the term Open Science (in the current meaning), and had a CiteULike group for that. 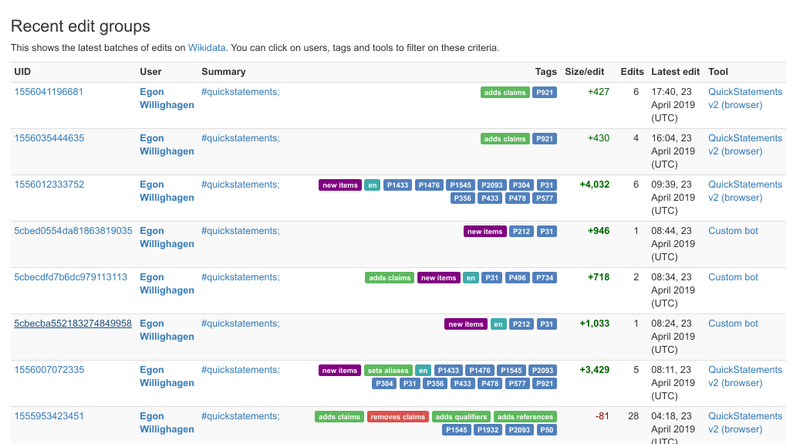 But CiteULike is shutting down, so I will blog the references I found, and add some context. A first article to mention is this 1998 article that mentions Open Science: Common Agency Contracting and the Emergence of "Open Science" Institutions The American Economic Review, Vol. 88, No. 2. (May 1998), pp. 15-21 by Paul A. David. Worth reading, but does require reading some of the cited literature. 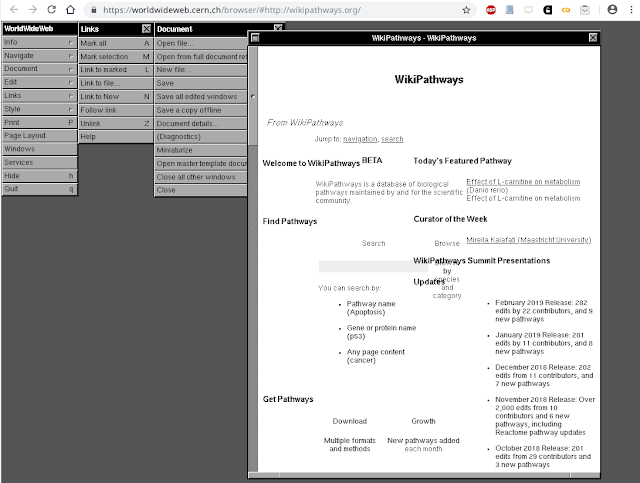 I would also like to note that the openscience.org website by Dan Gezelter went online in the late nineties already, which I have used in various of my source code projects, and, of course, also has been used by the Chemistry Development Kit from the start. In December I reported about Groovy code to create nanopublications. 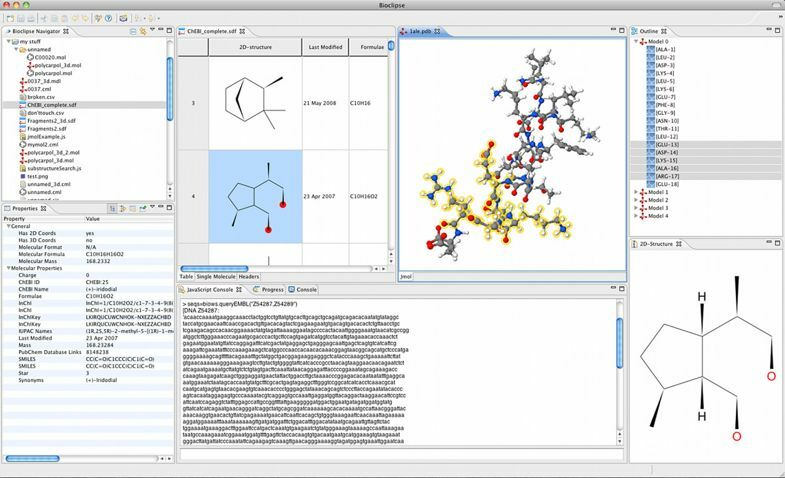 This has been running for some time now, extracting nanopubs that assert that some metabolite is found in some species. 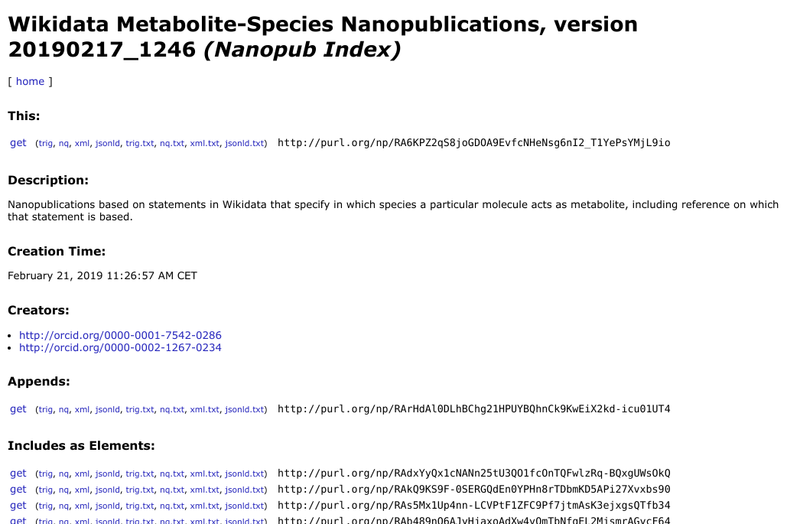 I send the resulting nanopubs to Tobias Kuhn, to populate his Growing Resource of Provenance-Centric Scientific Linked Data (doi:10.1109/eScience.2018.00024, PDF). 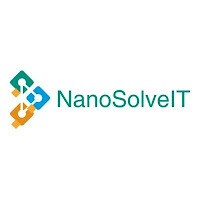 This January two new Horizon 2020 projects started for me: RiskGone and NanoSolveIT. It kept me busy in the past few weeks, with the kick-off meeting of the latter task week in Athens. Both continue on previous work of the EU NanoSafety Cluster, and I'm excited to continue with research done during the eNanoMapper project. 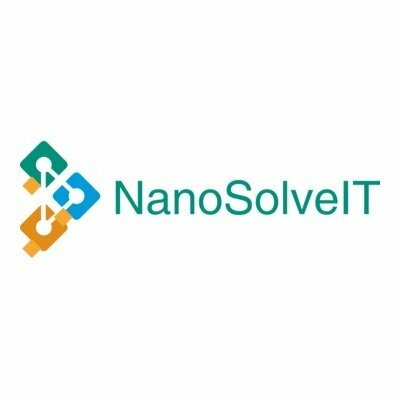 NanoSolveIT "aspires to introduce a ground-breaking in silico Integrated Approach to Testing and Assessment (IATA) for the environmental health and safety of Nanomaterials (NM), implemented through a decision support system packaged as both a stand-alone open software and via a Cloud platform." I will be involved here in the knowledge infrastructure. Plenty of research there to be done around the representation of chemical composition of the nanomaterials, the structuring and consistency of ontologies to capture and integrate everything, how to capture our knowledge around the adverse outcome pathways, and how to use this all in predictive computation. Here our involvement will be around similar topics. Oh, and like all new H2020 projects, FAIR and Open Data is central words. 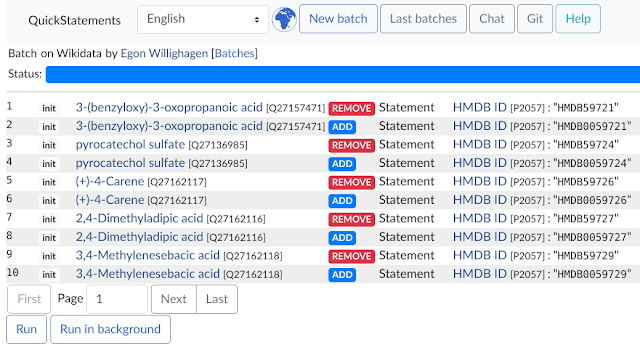 FAIR metrics for the Journal of Cheminformatics. 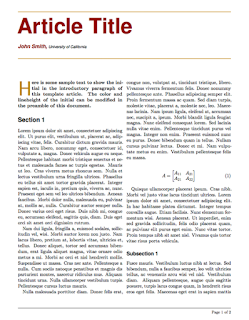 J. Cheminform. does not do well with sending these bits of information to CrossRef. 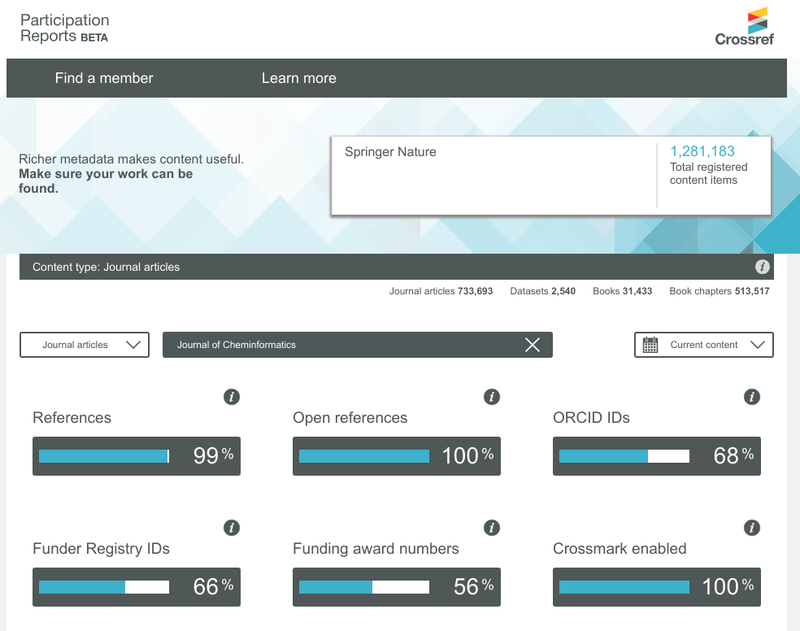 It's nice to see we already score well on ORCIDs and funder identifiers. I am not sure why the abstracts are not included, and text mining URLs could point to something useful too, I guess. The license URL sounds a bit redundant, since all articles are CC-BY, but downstream aggregators should not guess this from a journal name (or ISSN), and I'd welcome this proper annotation too. 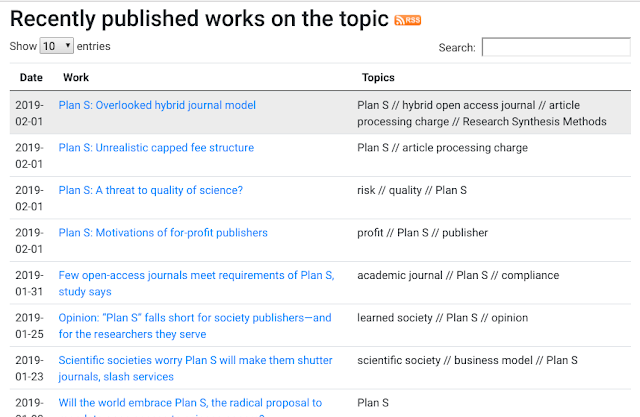 After Plan S was proposed, there finally was a community-wide discussion on the future of publishing. Not everyone is clearly speaking out if they want open access or not, but there's a start for more. Plan S aims to reform the current model. (Interestingly, the argument that not a lot of journals are currently "compliant" is sort of the point of the Plan.) One thing it does not want to reform, is the quality of the good journals (at least, I have not seen that as one of the principles). There are many aspects to the quality of a research journal. There are also many things that disguise themselves as aspects of quality but are not. This series discusses quality of a journal. We skip the trivial ones, like peer review, for now, because I honestly do not believe that the cOAlition S funders want worse peer review. We start with FAIRness (doi:10.1038/sdata.2016.18). This falls, if you like, under the category of added value. FAIRness does not change the validness of the conclusions of an article, it just improves the rigor of the knowledge dissemination. To me, a quality journal is one that takes knowledge dissemination seriously. All journals have a heritage of being printed on paper, and most journals have been very slows in adopting innovative approaches. So, let's put down some requirements of the journal of 2020. Pretty straightforward. For author, title, journal, name, year, etc, most journals apply this. Of course, bigger publishers that invested in these aspects many moons ago can be compliant much easier, because they already were. Second, what about the content of the article? There we start seeing huge differences. 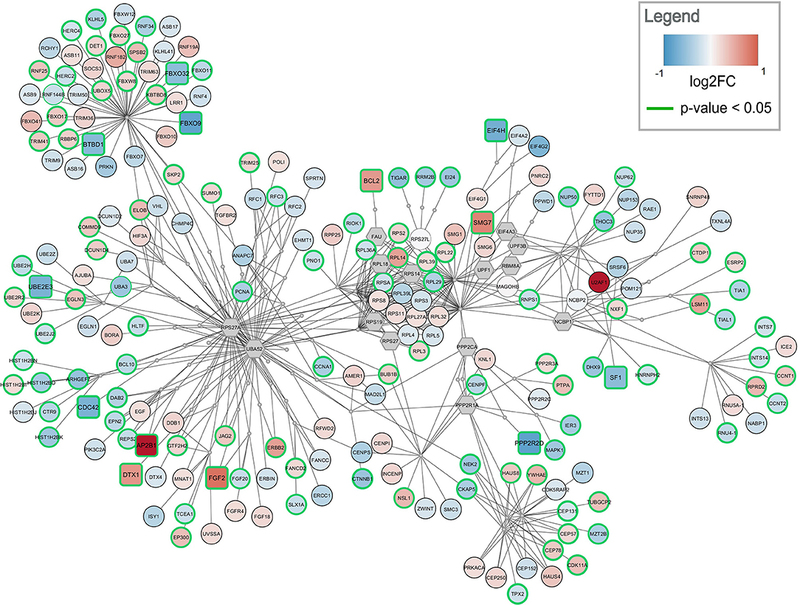 Here, the important concepts are entities like cities, genes, metabolites, species, etc, etc. But also reference data sets, software, cited articles, etc. Some journals only use keywords, some journals have policies about use of identifiers for genes and proteins. Using identifiers for data and software is rare, sadly. Here we see a clear problem. Publishers have been actively fighting this for years, even to today. Text miners and projects like Europe PMC are stepping in, but severely hampered by copyright law and publishers not wishing to make exception. Currently, the only serious standard used by the majority of (STM?) journals are MeSH terms for keywords and perhaps CrossRef XML for citations. 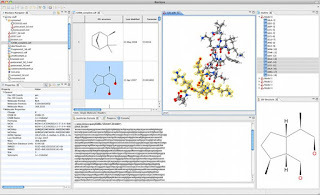 Table and figures are more than just a graphical representations. Some journals are experimenting with this. This is hard. These community standards are a moving target. For example, how we name concepts changes over time. But also identifiers themselves change over time. But a journal can be specific and accurate, which ensures that even 50 years from now, the context of the content can be determined. Of course, with proper Open Science approaches, translation to then modern community standards is simplified. The past few decades has seen a significant growth of journals. And before hybrid journals were introduced, publishers tended to start new journals, rather than make journals Open Access. At the same time, the number of articles too has gone up significantly. In fact, the flood of literature is drowning researchers and this problem has been discussed for years. But if we have too much literature, should we not aim for less literature? And do it better instead? Over the past 13 years I have blogged on many occasions about how we can make journals more reusable. And many open scientist can quote you Linus: "given enough eyeballs, all bugs are shallow". In fact, just worded differently, any researcher will tell you exactly the same, which is why we do peer review. But the problem here is the first two words: given enough. What if we just started publishing half of what we do now? If we have an APC-business model, we have immediately halved(!) the publishing cost. We also save ourselves from a lot of peer-review work, reading of marginal articles. And what if we just the time we freed up for actually making knowledge dissemination better? 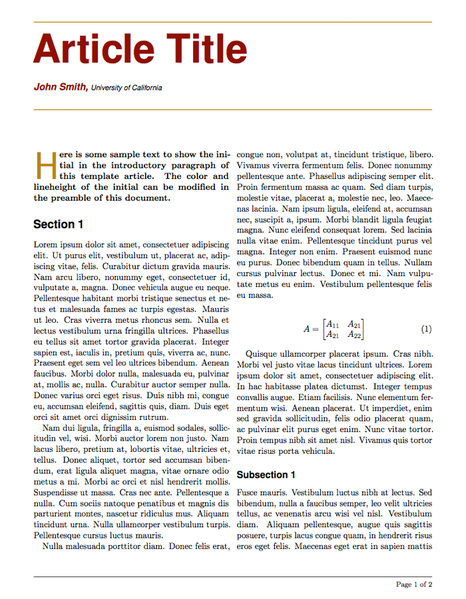 Make journals articles actually machine readable, put some RDF in them? 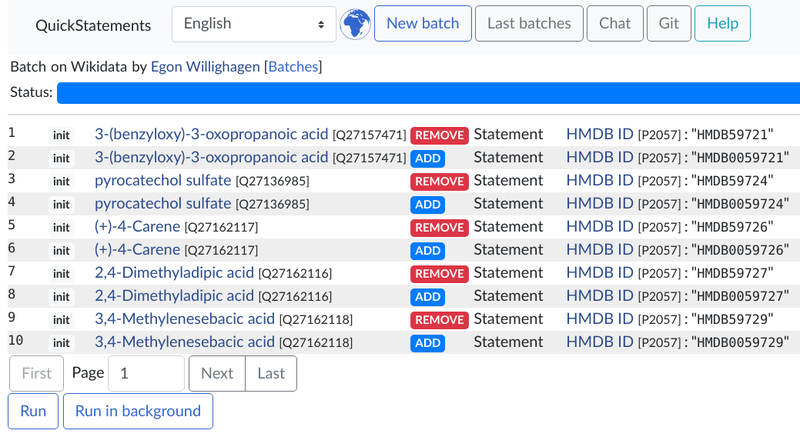 What if we could reuse supplementary information. What if we could ask our smartphone to compare the claims of one article with that of another, just like we compare two smartphones. Oh, they have more data, but theirs has a smaller error margin. Oh, they tried it at that temperature, which seems to work better than in that other paper. I have blogged about this topic for more than a decade now. I don't want to wait another 15 years for journal publications to evolve. I want some serious activity. 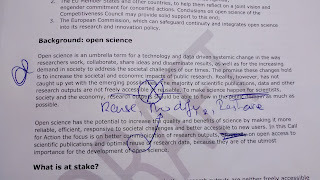 I want Open Science in our Open Access. This is one of my personal motives to our Open Science Feedback to cOAlition S, and I am happy that 40 people joined in the past 36 hours, from 12 countries. Please have a read, and please share it with others. Let your social network know why the current publishing system needs serious improvement and that Open Science has had the answer for years now. Plan S is about Open Access. But Open Science is so much more and includes other aspects, like Open Data, Open Source, Open Standards. 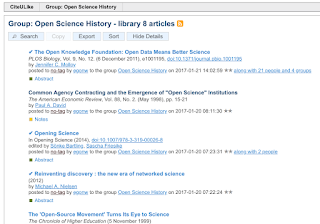 But like Publications have hijacked knowledge dissemination (think research assessment), we risk that Open Access is hijacking the Open Science ambition. If you find Open Science more important than Open Access, then this is for you. 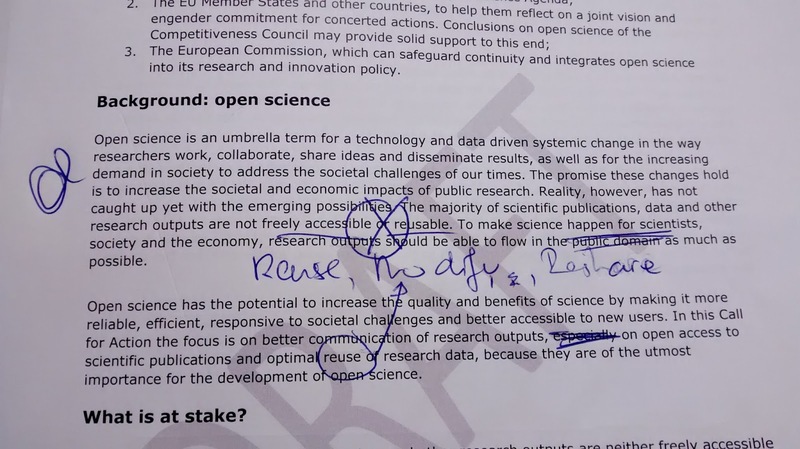 cOAlition S is asking for feedback, and because I think Open Science is so much more, I want the Guidance on the Implementation of Plan S to have more attention for Open Science. I am submitting on Wednesday this Open Science Feedback on the Guidance on the Implementation of Plan S outlining 10 points how it can be improved to support Open Science better.